Do you watch those programmes where someone takes a property in need of some TLC and turns it into a sparkly new, bang up to date, palace? I do too. Well, something similar is happening to the choir that I sing with, Chester Ladies. We’ve been working with our new musical director David Bebbington BMus (Hons), PGCert, MA, DipLSM, FLCM, FHEA for about nine months now. David is a talented vocal coach, pianist and teacher as well as a long established musical director and is bringing a fresh approach to learning and performing choral music. Rehearsals now include vocal warm ups, tips and techniques on how to improve the voice, and a distinct focus on perfecting rhythm and musicality. Many of the choir are reporting an improvement in their vocal range as a result of the exercises. We’ve been tackling some really tricky pieces such as Bill Withers classic Lean On Me, which is not only vocally challenging, but requires sound effects which make us giggle but are certainly effective. There’s no doubt that being in our choir is not an easy, once a week hobby. It requires commitment to learning words, as we perform without copies, and we are encouraged to stretch ourselves vocally. You never know what you can achieve until you try. We welcome new members, so if you love to sing and are willing to commit your time and energy to being a better singer, then why not give us a try? When you sing with a choir, Christmas starts early. Very early. In fact we started learning Christmas music in October, so it’s fair to say we are pretty consumed by the season of goodwill already, even though it’s still two weeks away. This week there have been two Christmas concerts. Our main event was at Wesley Church Chester where we showcased our seasonal repertoire which includes firm favourites White Christmas and Winter Wonderland as well as sacred pieces Pavanne For A Silent Night and Gaudete. Our audience had to do their bit too, with a sing along of Saviour’s Day to end the night. We had some amazing guests: Dylan Cernyw on harp and local Chester singers Megan Lamour and John Henry. If you have never heard a harp played professionally, then seek out one of Dylan’s performances. I promise you will not be disappointed. We raised £248 for Guide Dogs, a charity which is especially close to our hearts, as one of our choir members, Clare, will have her own guide dog in the new year. Our second gig was at Chester’s St Mary’s Centre, where we were guests of Theatre In The Quarter, celebrating choral music with ‘Joy To The World’. We shared the stage with some wonderful local choirs: Dee Sign Choir, Hoole Community Choir, Dragonsong and Hope Street Harmonies. The atmosphere was buzzing as Matt Baker hosted this fun evening which was a real treat for anyone who loves to hear a choir sing. Of course, it’s not over yet! Next week we are singing for a local charity and will also be at M&S Outlet Cheshire Oaks singing carols to raise money for Guide Dogs. If you would like to be doing this next Christmas, then why not join us in January? We meet at St Luke’s Huntington 7:30 to 9:30 Tuesday evenings. Enjoy your Christmas, music lovers! There comes a time in your life when you just don’t care what other people think of you. At the grand age of 54 (and a half) I’ve reached it! I was in the gym today, having a cappuccino and reading a magazine; in other words, not actually exercising. Did I feel the need to offer an explanation? No. I buy what I like to wear – whether it be in fashion or not. In fact I have a wardrobe full of what could be deemed as inappropriately fluffy items of clothing which make me look like a hamster, but so what! I sing out in choir, whether I’m confident I know a piece or not, I don’t mind getting it wrong. It’s not a crime, it’s a song. I wear ugly shoes for walking. You can’t make people like you, and if they are gossiping about you, then at least they are leaving someone else alone. I buy loads of things from charity shops and don’t care who knows it. When I feel the need to wear sequins, I do, whether it’s Christmas or not. When I feel the need to stay in my PJs, I do. I don’t feel peer pressure to have an extra drink, stay up late, have the latest phone, run a marathon or whatever. I don’t brush my hair very often and don’t care how wild it looks. Why on earth it’s taken this long, I have no idea, but it’s a good place to be. I’m sure I’m not the only one who is very excited about our upcoming London trip with The Chester Ladies’ Choir. We will be singing at the Royal Albert Hall in November to help raise money for Cancer Research UK. We’re taking part in Festival of Brass and Voices which raised £160,000 for Cancer Research UK the last time it was held. 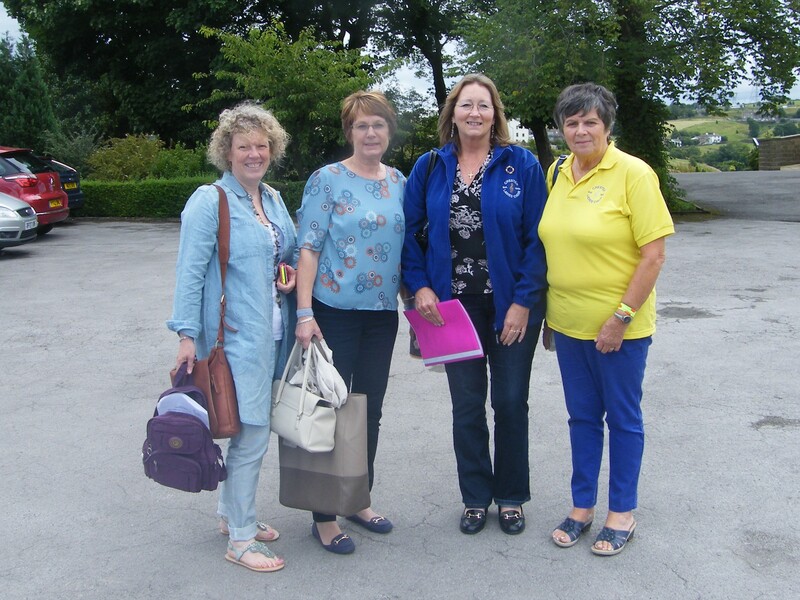 We’ve been rehearsing for months, meeting up with other choirs from around the country. This is us in beautiful Huddersfield. all ready to start singing. We’re singing some beautiful pieces, including choruses from Verdi’s Aida, and the rousing Land of Hope and Glory. I’m sure there will be much flag waving and a few tears on the day. I’ve never been to the Royal Albert Hall and am incredibly excited at the thought of standing on stage looking out at such a huge audience. I will of course be reporting on what we all get up to on our weekend away! If you would like to donate to this important charity to help beat cancer sooner, please click on the link below and give whatever you can afford. Every pound and every penny will go towards Cancer Research UK’s lifesaving research. If you are a tax payer, you can always click the Gift Aid box to add even more to your donation. 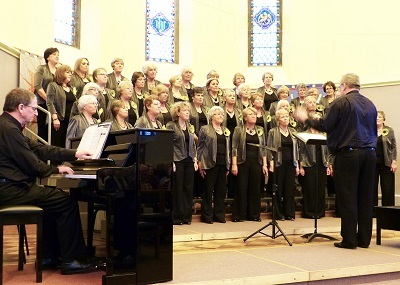 I sing with The Chester Ladies’ Choir and for anyone that loves to sing, it’s a fabulous group to be a part of. Our new term starts next Tuesday 8th September and this is the ideal time to join. In fact, if you would like to come along and see if it’s for you, you are welcome to come along to a practice for free as a ‘taster’ session. We start with a few vocal warm ups led by our MD David Bebbington. Then we usually work our way through two or three pieces of music in each session, each geared towards an upcoming concert. A session lasts two hours (7:30 til 9:30 p.m. with a break for tea and chat!) and we meet at St Luke’s Huntington every Tuesday. It costs £30 per term to be a member (three terms a year) which is just a couple of pounds a time for a great night out. We sing all sorts of music, from the Beatles to sacred pieces. There’s something for everyone. We’re a mix of ages from twenty something upwards. We perform a few times a year at various venues, including Christmas and summer concerts at popular venues in Chester. Fancy it? You can email me on Christine.dodd224@live.co.uk or tweet me @flowerpowerlife to let me know you are coming for a taster session. Our website is here. Why not take a look? I’ve been singing with The Chester Ladies’ Choir on and off since 1982 (I’ll leave you to do the maths). I first joined because singing in the bath was just not enough, and there was no X Factor or karaoke in the eighties, otherwise I’d have been there like a shot! These days, I’m there as much for the friends I’ve made along the way, as I am for the music. We rehearse every Tuesday and spend a good time of that chatting! I’m also on the committee, which is great, as you get involved with others on a different level when you work as a team. We perform several times a year in concert. It’s quite a buzz getting up on stage and having an audience respond to you positively. We often sing for charities and it’s very rewarding to know you are helping someone out whilst having a great time yourself. Our repertoire is pretty varied and includes contemporary music, songs from the shows and classics. My current favourite is The Gypsy Song from Bizet’s Carmen and The Lord is My Shepherd arranged by Howard Goodall, which you would recognise as the theme tune to The Vicar Of Dibley. We’ve also been known to go on tour! 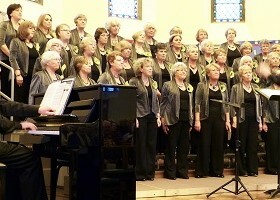 Our last trip away was to Bath where we performed at a concert with a local choir and had a fab weekend to boot!